The only copyright protected and authorized by Prof. Wilhelm Wagenfeld reedition. Please note: delivery without bulb! 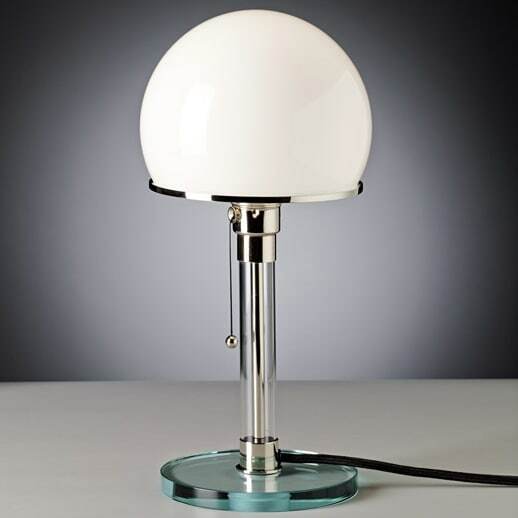 This table lamp, designed by Wilhelm Wagenfeld in 1924, is often named the Bauhaus lamp. Today as well, the Wagenfeld table lamp WG 24 continues to be manufactured on this basis, following the original specifications for dimensions and materials. All lamps are consecutively numbered under the base and bear the Bauhaus and TECNOLUMEN ® logos. As proven by being named "the Bauhaus lamp", Wagenfeld's lamp is a masterpiece illustrating both Bauhaus philosophy and TECNOLUMEN®'s dedication to Bauhaus design. TECNOLUMEN ® produces 4 different versions of the lamp, all authentic designs by Wilhelm Wagenfeld. Since 1986 in the shop of the Museum of Modern Art, New York. Do you have a question about "Wagenfeld WG24"? How can we contact you?